"We're stuck!" he said. "Can you help us?" 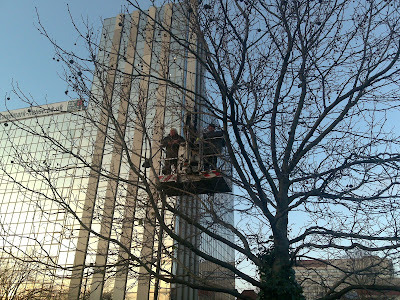 Which was how I ended up clambering onto a crane and trying to open a hatch so I could press a button that would send power up to the cherry-picker's cabin and allow them to get down. Except, I couldn't open the hatch. 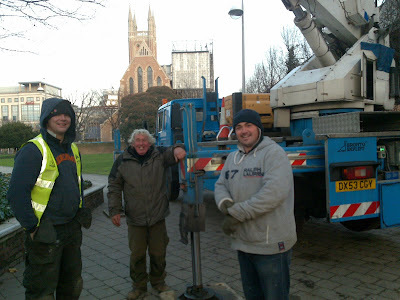 So the men then shouted across to a man in another crane and asked if he had a screwdriver he could drop down to me. As he rummaged in his tools, I took a pic of the men in the cabin. "Am I on camera?" I asked, and the men laughed. With the newly acquired screwdriver, I was able to open the hatch and get to the big red button. Within a couple of minutes, the men were back down on the ground, visibly relieved not to be spending the rest of this bitterly cold afternoon aloft.